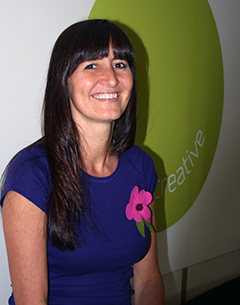 An entrepreneur and creative thinker, Karen Lambert is the founder and Managing Director of Happy Creative a strategic marketing and branding agency based in Lancashire whose brand is all about authenticity and expressing her own personality. Karen has consciously made a choice to align herself and her business with a network which mirrors her positive attitude to business and to life in general. This positive mindset ensures that the good days outweigh the bad. “I am surrounded by people who believe in me and this business. My team of Happies are a positive, energetic and determined bunch and – truth be told – a tiny bit crazy, too. And my business friends are full of great experiences, similar challenges, a positive outlook and a desire to succeed, so we all bounce off each other. Karen believes that the most important thing in business is to be yourself. This is her number one mantra and has been key to creating a successful business. Before creating Happy, she had little or no experience of running a small growing business. “I haven’t been surrounded by entrepreneurial role models and I’d worked only for global companies. I remember when I first started that I felt that I should become all serious and formal because this was how I thought I should act. “But I thought, ‘be true to yourself, Karen’. It didn’t feel right to let my personality be hidden and to be something that I wasn’t, so I chose my own unique way. Another facet of authenticity for Karen is constantly pushing our own personal boundaries and experiences so that she is continuously evolving and developing in line with her own values. Like most small businesses it’s a constant balancing act. Happy Creative started off with three people and now there are ten. Initially, Karen did everything herself from setting the strategic vision, marketing and business development to cash-flow, invoicing, wages and processes. By doing whatever was required and being prepared to operate out of her comfort zone Karen learned that continuous learning is key to developing strong leadership skills. This thirst for self-improvement, knowledge and increased awareness encouraged her to join her Academy group four years ago. She has also greatly enjoyed listening to some of the Academy’s motivational speakers, in particular Phil Jones from Brother UK, Helen Varey, Roy Jones and Humphrey Walters, who coached the England Rugby team. Karen describes her journey to-date as having had “more emotional ups and downs than a Blackpool Pleasure Beach rollercoaster”, from exhilaration, pride, excitement and happiness to frustration and exhaustion. But this has done little to put her off and she is now firmly on the path of the serial entrepreneur with the recent launch in August of Rugs & Kisses – an e-tailer of beautiful, quality rugs. “I sometimes think that I’ve seen it all,” she says, “but deep down I know there will be other challenges and emotions to experience and conquer in the coming years with this new business. “As an entrepreneur you live outside comfort zones; constantly pushing and stretching yourself. It is however a great life experience; and one I would not change. In truth I have never looked back; and I’ve seen myself grow both personally and in the skills I have developed.